If you're a first time dog owner and are scratching your head at the prospect of controlling a member of a different species, this article is for you. 'Watch Me' should be the first command people teach their dogs. Let’s face it, if you don’t have a dog’s attention, teaching them anything else is pretty much futile. This is exactly what watch me is. I want to teach a dog that, with either a hand signal or a verbal cue (watch me), the dog will stop what he is doing and look me in the face and wait for the next command. Watch me can be used for a variety of reasons, but for me it’s the first step in stopping problem behaviours. Put simply, dogs rarely can walk and chew bubble gum at the same time. So the dog is engaging in a behaviour I don’t like, the first thing I will do is ask for a watch me. For that split second when the dog stops the inappropriate behaviour, I have, in essence, won the battle, but not the war. The war is teaching the dog an alternative behaviour to replace the bad behaviour. For example, if my dog is chewing on my prize pair of shoes, I will first negatively mark the behaviour (make the EGGHH. noise), then ask for a watch me (to gain attention) and finally ask for a sit (alternative behaviour) to take the place of the chewing of shoes. As many of you know, I truly believe that the smartest trait a dog trainer can have is the ability of Ignoring the bad and rewarding the good. This becomes the first tenet for winning the war of bad behaviour, and watch me becomes the first line of defense for your campaign. So how do I teach my dog this wonderful little trick? Start with a high value treat, and place it right on the end of your dog’s nose, but don’t let him have it yet. Once you have the dog’s attention, move your hand up towards your face. When your dog looks at you (at this point really looking at the treat) praise (or click, if you are clicker training) and reward. As the dog becomes more comfortable looking up at your face, begin to shape your verbal and hand signals. I use my index finger pointing at my nose for my hand signal and simply say the words watch me as my verbal cue. Mike Deathe is a professional dog trainer and writer. He kindly shares his wisdom with K9 Magazine from time to time. 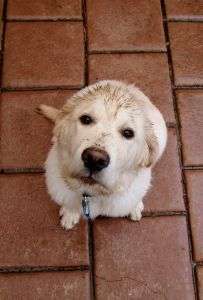 For more invaluable tips on dog training and dog ownership, you really should check out his blog www.muttzrus.com. Muttz R Us was founded in 2009 by me and my wife Kate. Several years earlier I decided to quit my job as a district manager of an automotive care firm and became a stay at home dad. Kate worked for the Federal Government and was traveling up to three weeks a month. Between the two of us we decided one of us should take a step back so that someone was home with the kids. We have two boys, Donovan and Dylan. Life went on, with me being Mr. Mom (my love and respect go out to all the stay-at-home moms and dads…it’s harder than it looks.) I told Kate “I’ve got to get a part-time job.” After 15 years of being in the workforce, I needed something besides game shows and soap operas while the kids were in school. I took a part-time job at a national pet supply chain and before I knew it, I became a dog trainer. A passion was born. I have had dogs since I was four years old and currently my family owns four. We have three muttz, Penny, Lexie and Bear, and we also have a Purebred (yes, even I own a purebred.) Leonberger named Leo. She was adopted, just like my other three muttz. She is sight impaired with roughly 70% vision loss, which adds a different aspect to socialization and training for a dog. I primarily train on weekends, which are the same two days the company I work for invites adoption groups into the store. I regularly saw the number of dogs and cats that never found a home. It made me wonder how many people actually realise the number of wonderful and viable pets that are wanting and needing loving homes. We decided that "Adopt a Pet, Save A Life" should be our philanthropic motto. We paired that along with our desire to help animal organizations raise funds and came up with T-shirts to make fun of our Purebred cousins (remember, I own one too..), and "Ta Da. ", Muttz "R" Us was born.